I love working with tools and wood and all of the cool equipment that goes with it but I am not very good at it. If a project calls for precision in measurement or requires cuts that are "right on" I always win the white ribbon and end up with a product that is usually non-functional, not level and out of balance. But then.....I started building milk stools, something I could handle; rough wood construction, a design requiring only estimated measurements and never out of balance. When I was a young man I did not need a stool to milk goats, I would just crouch down like a baseball catcher and milk. 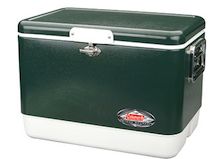 As I got older I then graduated to an ice chest. It provided a nice place to sit while milking and enjoying refreshing ice cold beverages. Now I use a 3-legged stool to milk my goats. 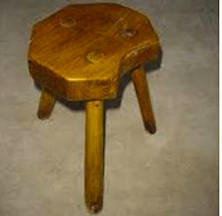 I have several stool I have built, they all balanced. It's amazing the contraptions we come up with to accommodate our aging bodies! For a while I used an overturned bucket until that fell apart - I like your cooler idea too!